In October, as part of Gothic: The Dark Heart of Film, a nationwide celebration of gothic film and TV, the BFI will bring the legendary BBC 'folk horror' tale Robin Redbreast (1970) to DVD for the first time ever. With its combination of unsettling folk rituals and insular regional communities, Robin Redbreast is considered to be an influence and precursor to The Wicker Man (1973), and has built up a cult following over the years since its original broadcast in the Play for Today strand. Norah Palmer (Anna Cropper) is a television script editor who temporarily moves to a remote English country village to rebuild her life after a bad break-up. At first, she finds that the villagers are friendly, if a little eccentric. When she becomes pregnant to the handsome gamekeeper Rob, she begins to suspect the locals of conspiring against her, preventing her from leaving the village for her home in London. Made during the golden age of British TV chillers, this provocative and disturbing drama was directed by the renowned producer/director James MacTaggart from a script by John Bowen (A Ghost Story for Christmas: The Ice House, Dead of Night: A Woman Sobbing). 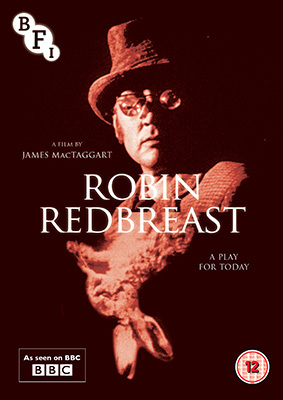 Robin Redbreast will be released on UK DVD on 28th October 2013 by the BFI at the RRP of £19.99.